Things have been a bit chaotic here with my mom in from out of town, a big event at work last week, planning a pancake breakfast for my son’s high school music boosters program tomorrow and preparing for other various family activities this weekend. 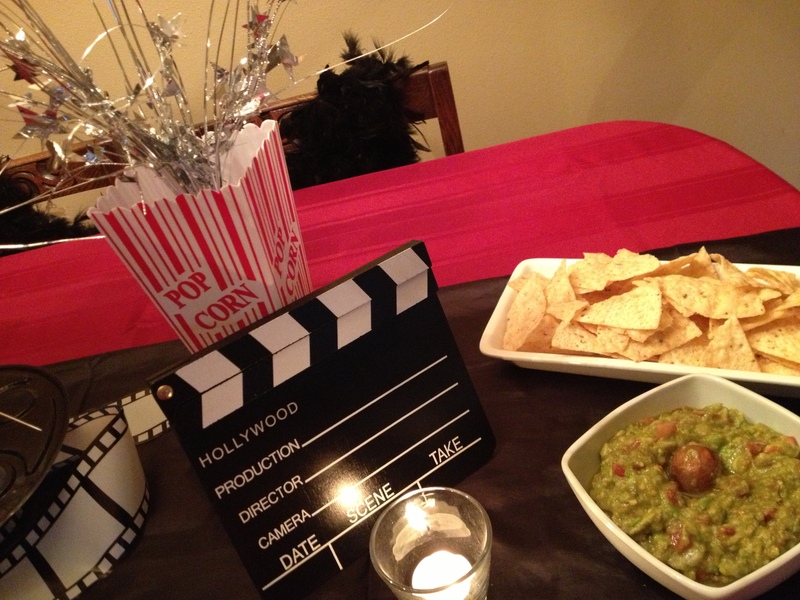 But I didn’t want to miss out on showing you the set-up I did the other night for our Academy Awards viewing. 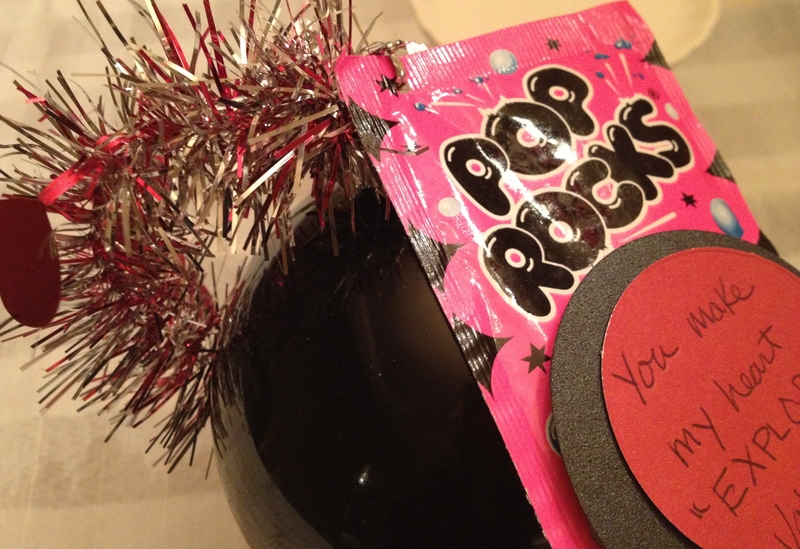 I borrowed inspiration (and a few supplies) from the big party I threw last week at work. 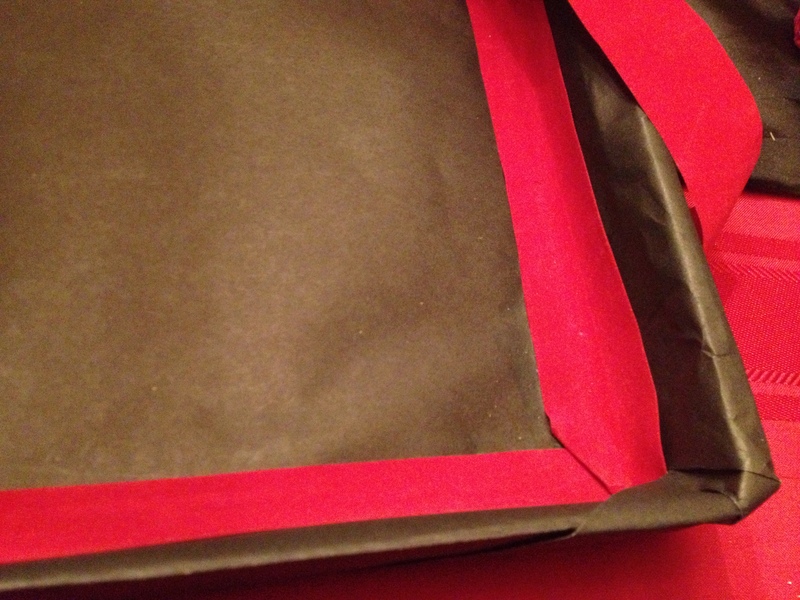 On the table, I started out with a simple red table cloth topped with a black length of silk fabric down the middle. 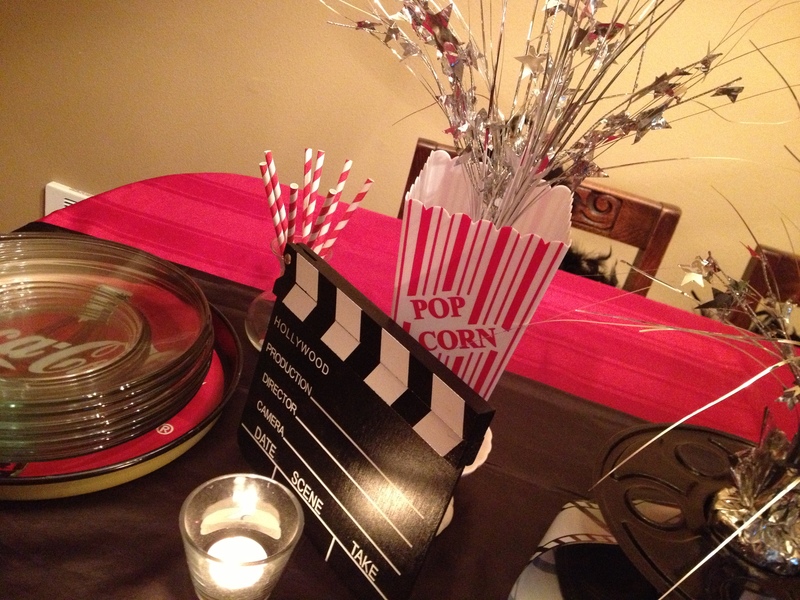 I added a party movie reel (I found this one at the local party store but you can buy these online) and two plastic popcorn boxes (from the dollar store) on small white pedestals – these are actually candle holders, but I use them all the time for various foods and decor for table settings. 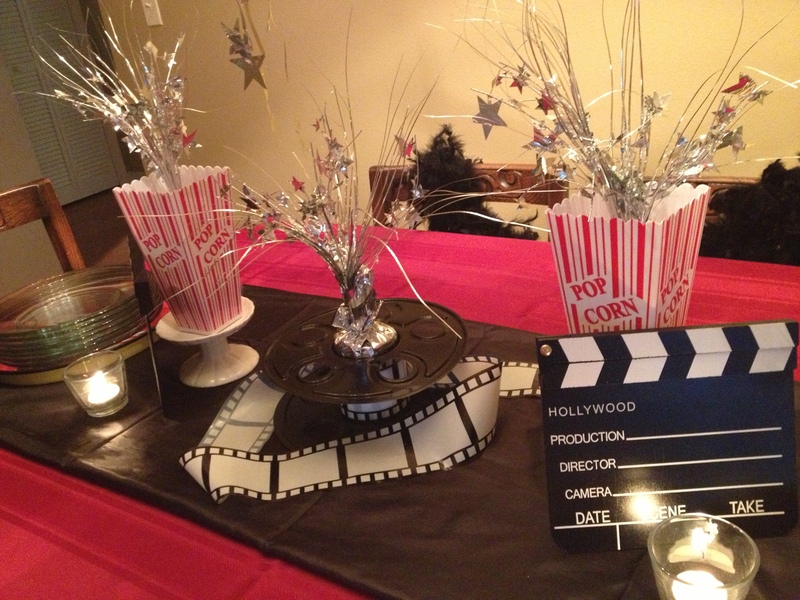 Think out of the box when choosing things from around your home for a party! 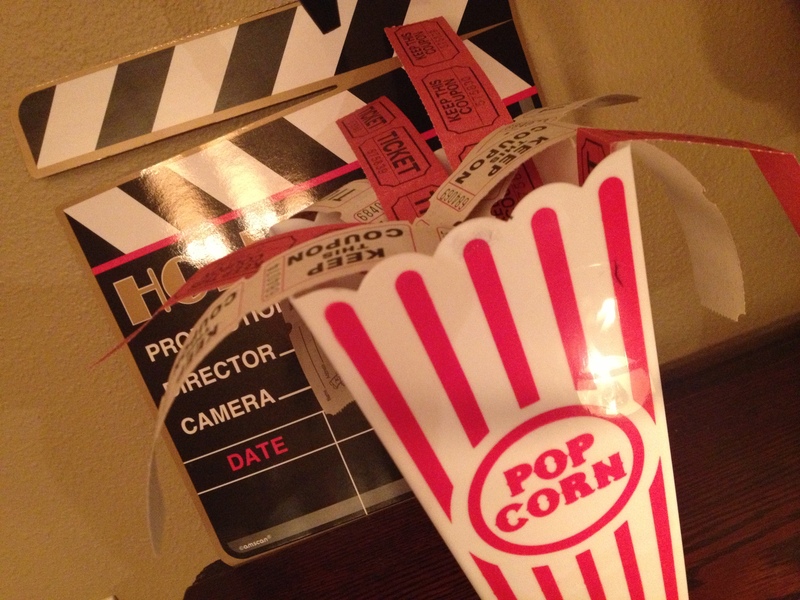 I placed silver balloon weights in from the dollar store into the small popcorn buckets and in the center of the film roll. 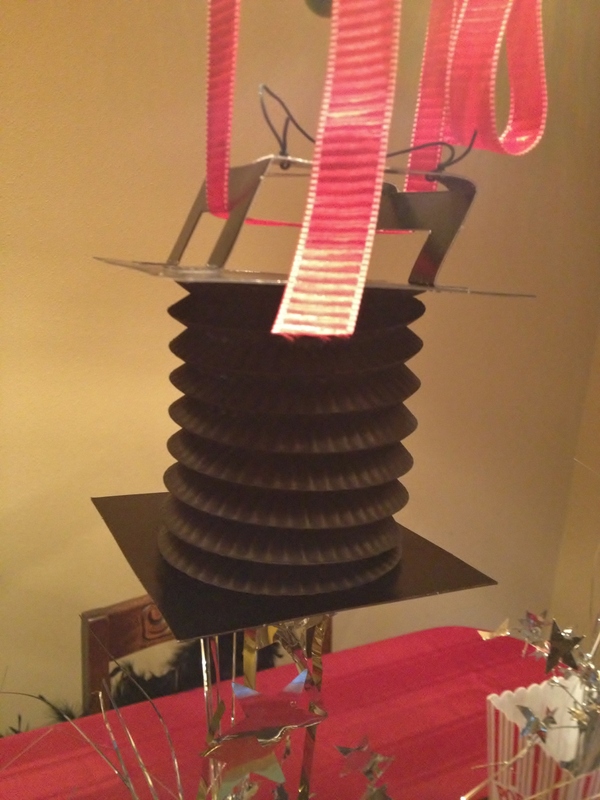 This movie light lantern that I hung from the chandelier was actually part of a party garland I’ve had in my party supplies for many years but the garland itself is pretty shabby looking – so I just took one of the lanterns off the garland and used it alone. 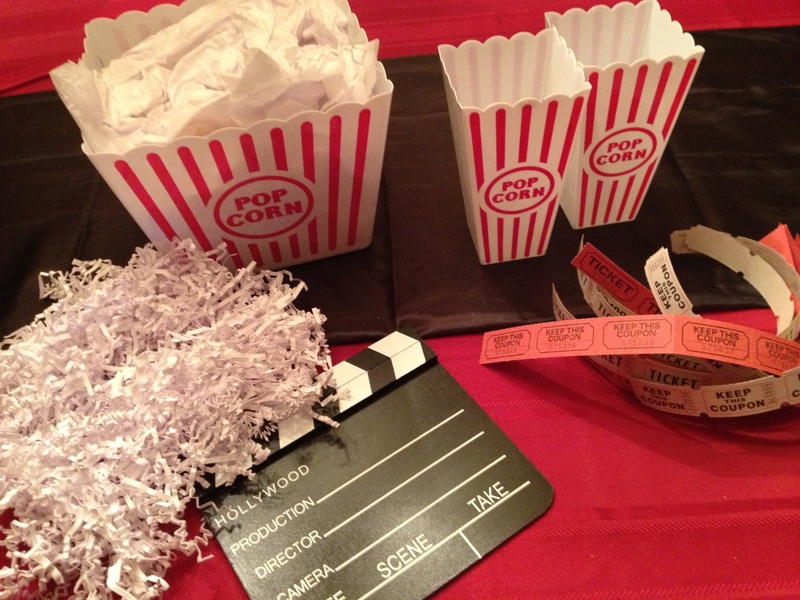 Simply add a couple of movie clapboards from the party store and candles for a nice evening glow. 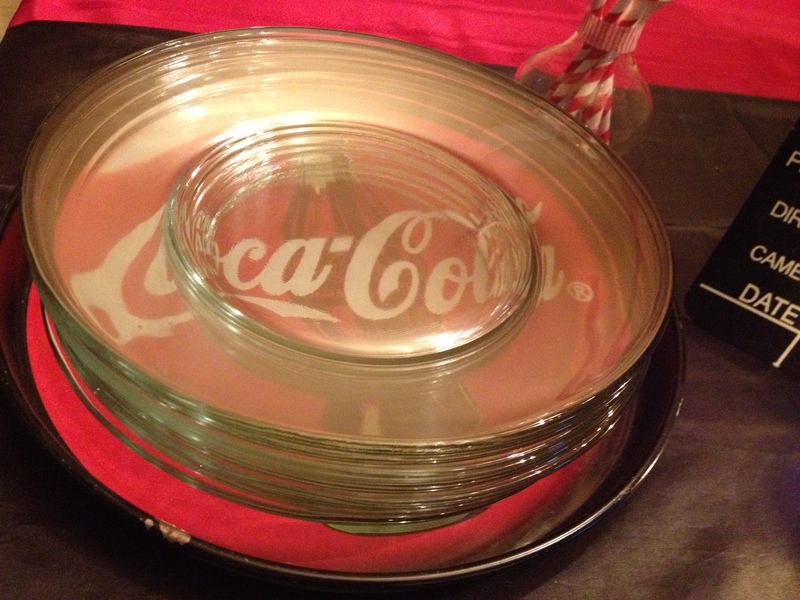 I just love picking things up for my table when I am out thrifting – this vintage coca-cola tray finally came in handy with clear dollar store plates stacked up in it. So fun to see the graphics on the tray peeking through the glass plates! 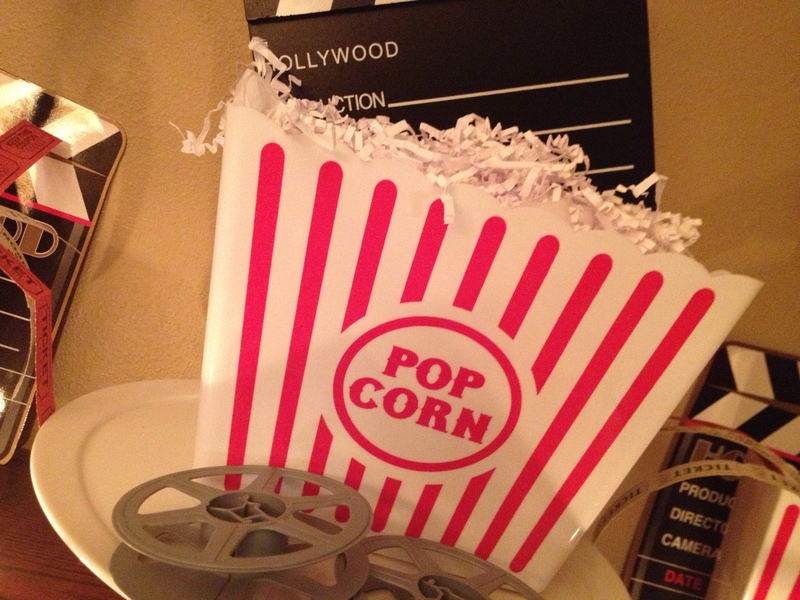 I placed one of my popcorn bucket centerpieces from last week’s party on my china cabinet. 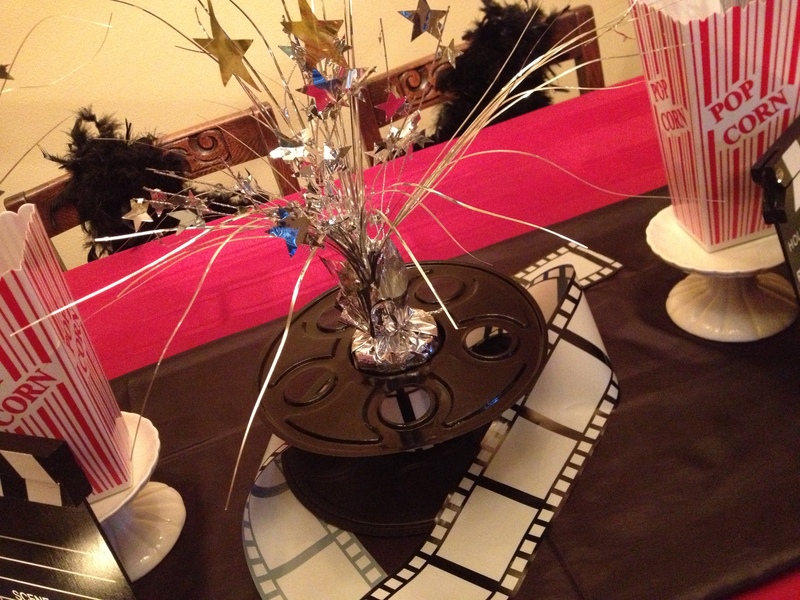 The large bucket looks great lifted up onto a cake pedestal. 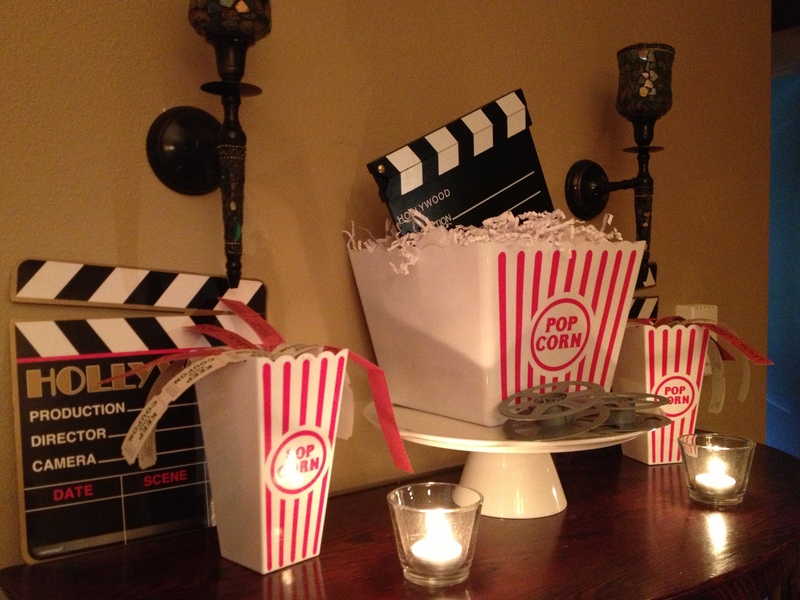 Again – don’t be afraid to re-purpose your favorite items from around the house to incorporate into your tablescapes. 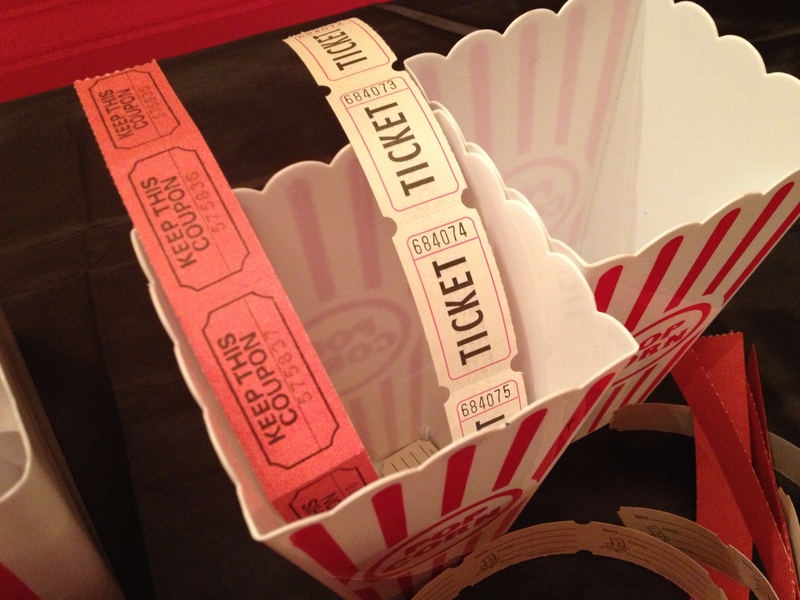 I bought the popcorn buckets, paper shred and raffle tickets all at the dollar store. And again just added a few items purchased at the party supply store. 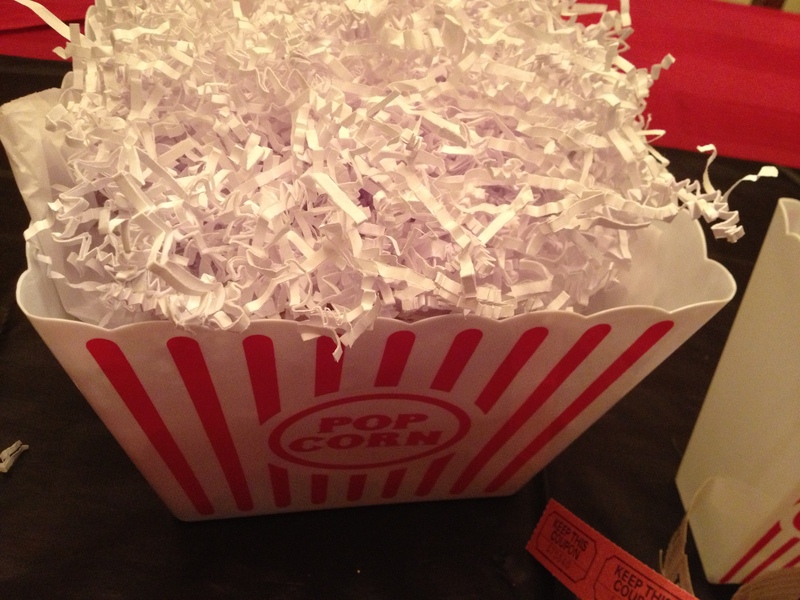 Fill the large popcorn bucket with crumpled butcher paper, tissue paper or even newspaper. Add the white paper shred on top to completely cover the butcher paper. 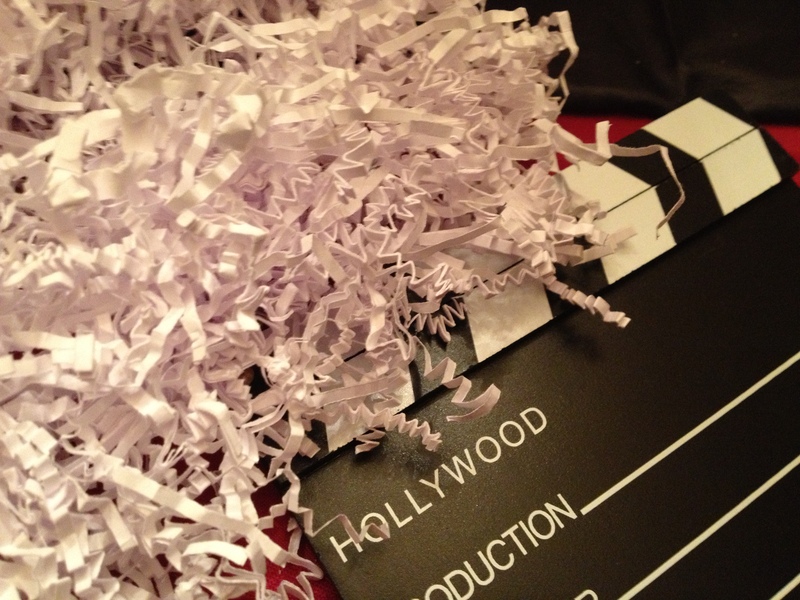 Then perch the clapboard at an angle into the shred. You may have to play with it a bit to get it to stay in place. 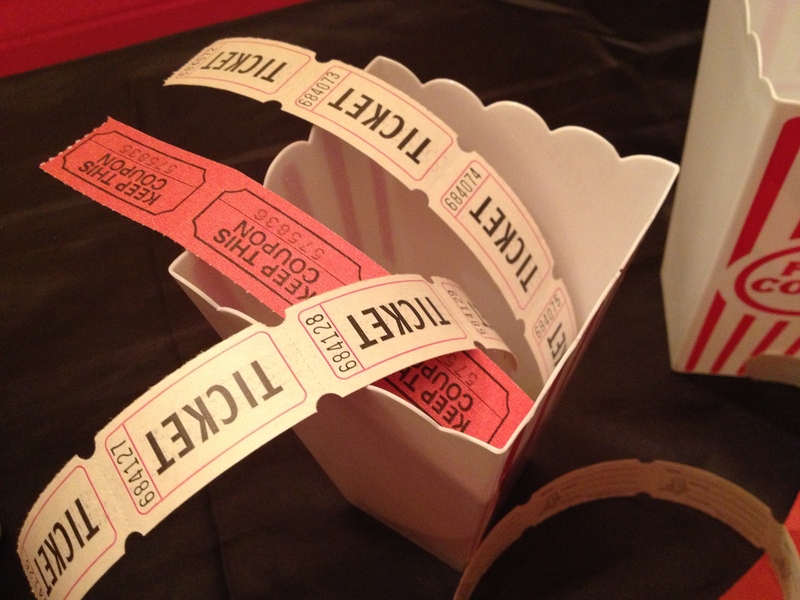 Tear the raffle tickets into twelve single strips of four to six tickets. 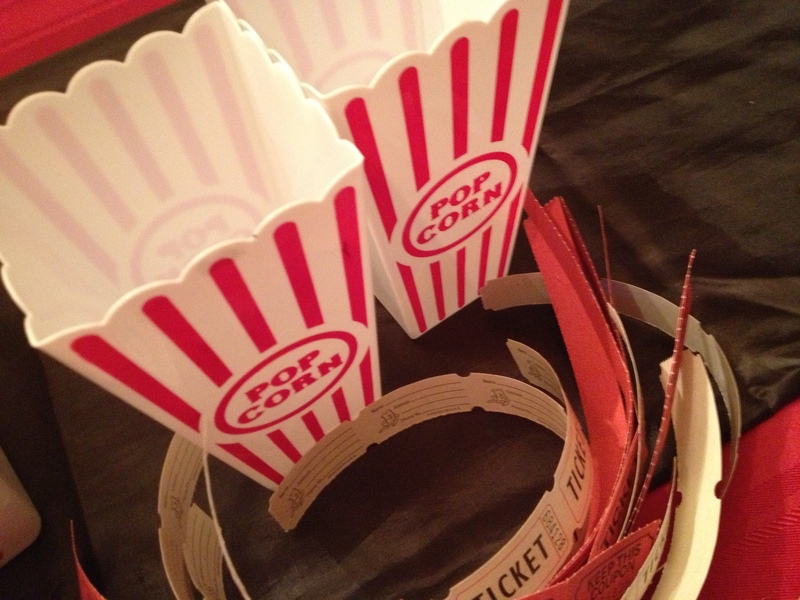 Place six strips each into the two small popcorn buckets, alternating colors as you go. Three of each color. It’s fine if this is done sort of haphazardly – that’s the look you are going for! 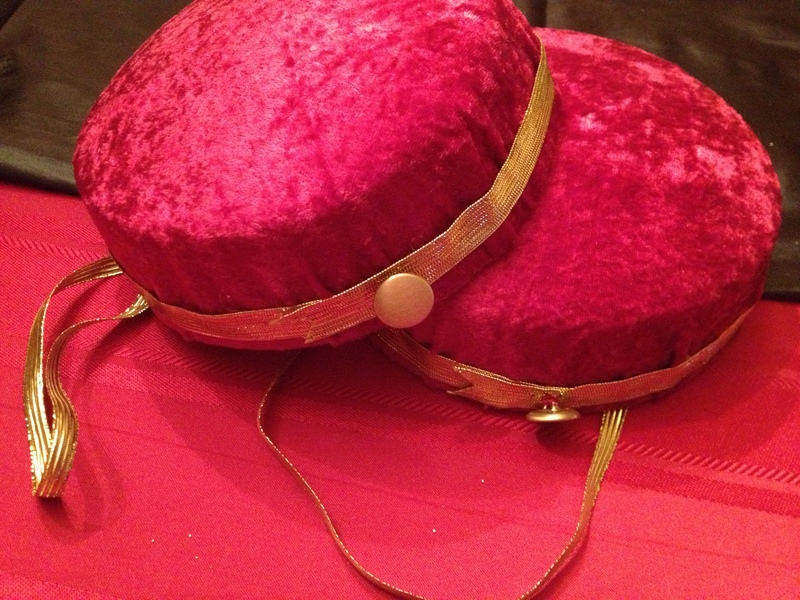 I bought the hat forms, velvet-like fabric and gold trim at the costume supply outlet and the gold buttons at the fabric store. 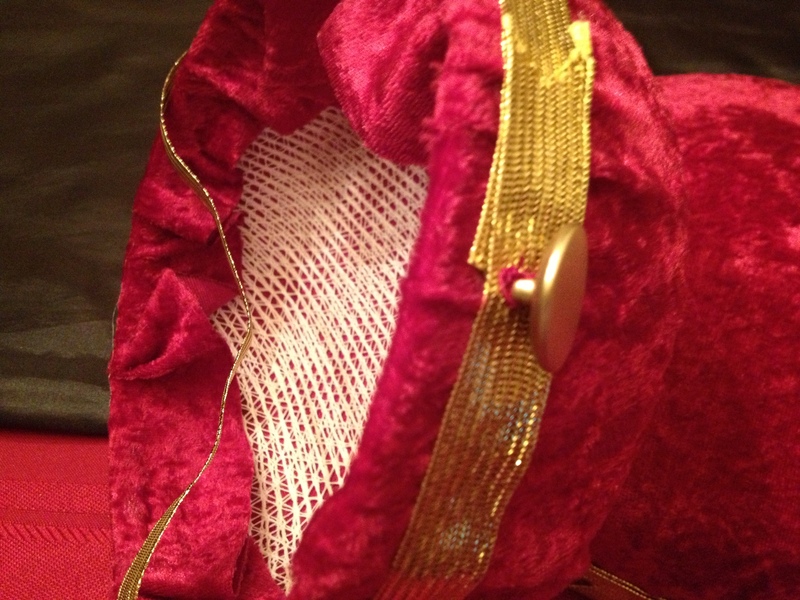 and sewed a gold button to it for an accent, then attached thin gold elastic trim to the inside (with needle and thread) for a chin strap. 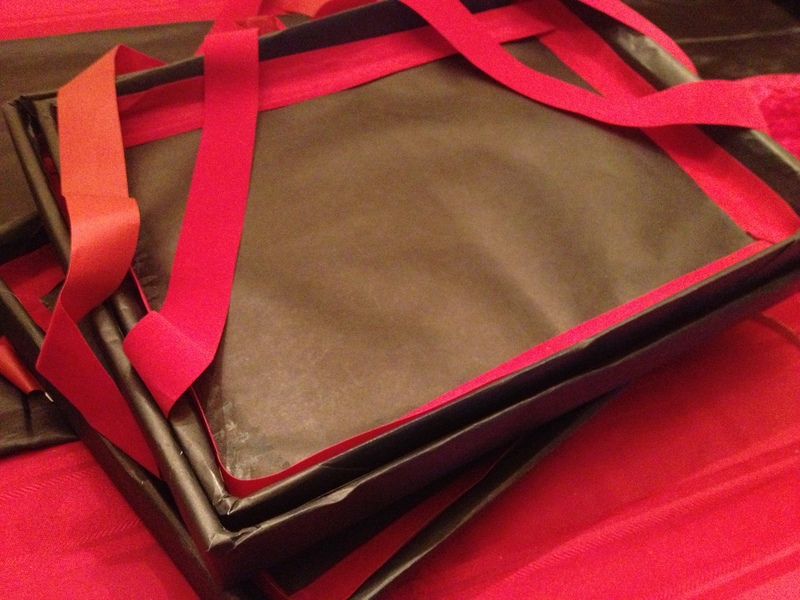 The usher trays were made using banker box lids, black wrapping paper and wide red ribbon. 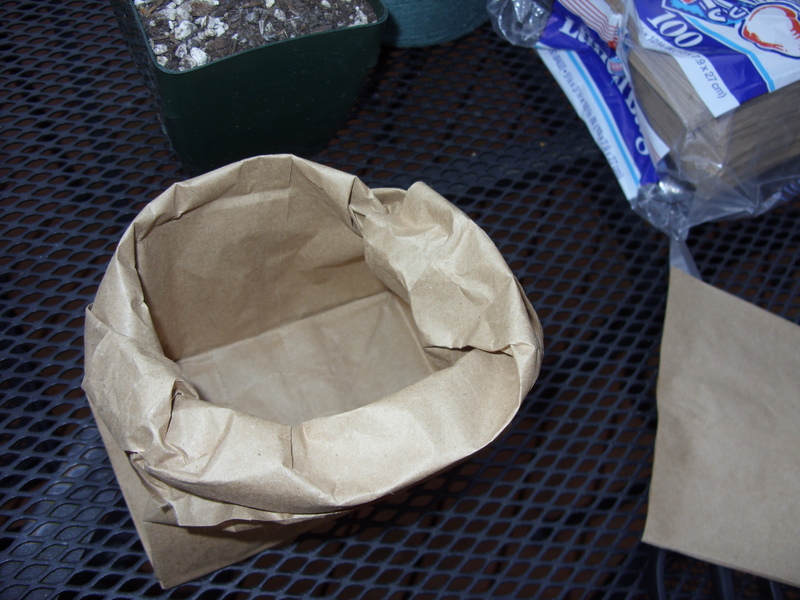 Cover the lids with black paper – you could also use butcher paper. Attach with hot glue or craft glue. 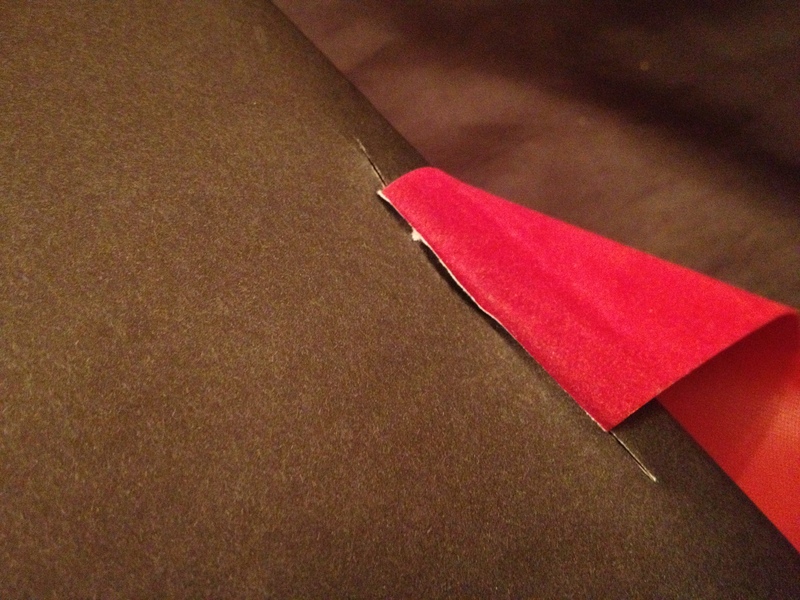 Trim the inside edges of the lid with the ribbon. Then glue on the ribbon “strap”. 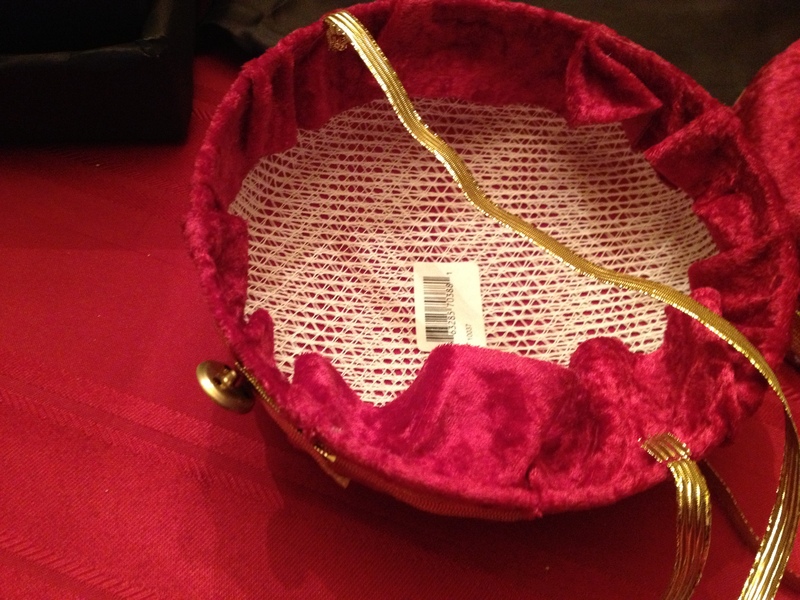 Cut one length of ribbon and attach each end to the bottom of the “tray”(on the short sides) about 5” from the corner. Mom got fancy with these and threaded the ribbon through the box lid sides before she covered the lid with paper. She cut a slit in the paper to thread the ribbon through. I was hoping that my boys would dress up all in black and don the usher costumes so that they could serve the adults our snacks. But alas – here they stayed all evening on the chairs. I still think they are adorable – even sitting on a chair! 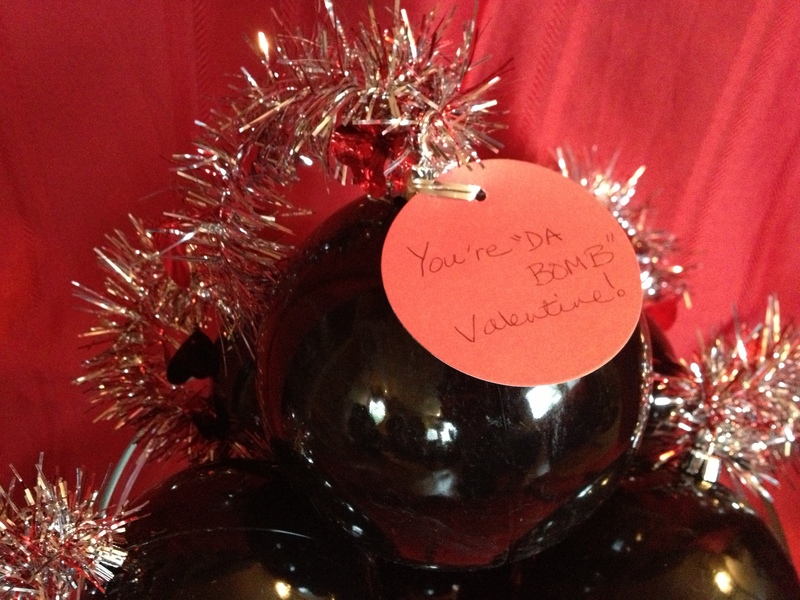 I love Valentine’s Day – Pink & red, hearts, poetry, chocolate – what’s not to love? But I live in a house full of boys. And mushy, heart-shaped anything is just not a part of their testosterone sensibility – they generally prefer things that go “boom”. 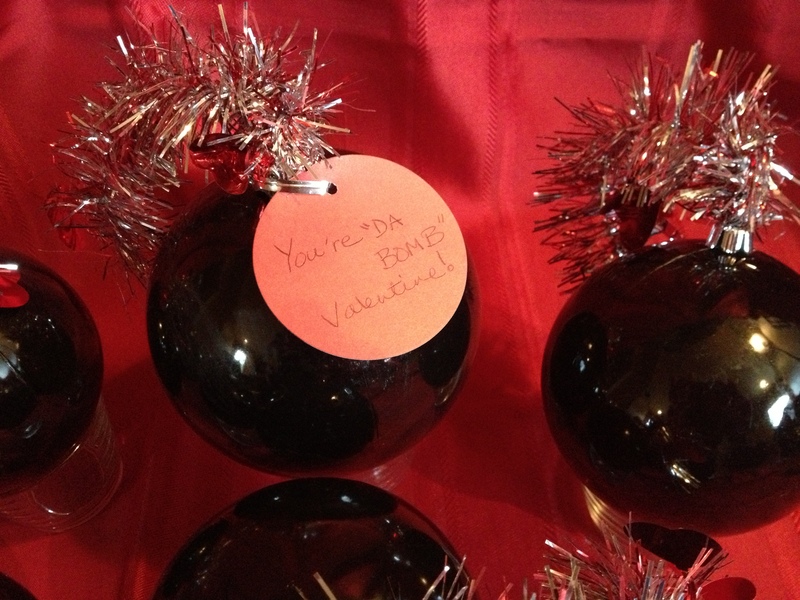 So this year I am sending them love bombs! 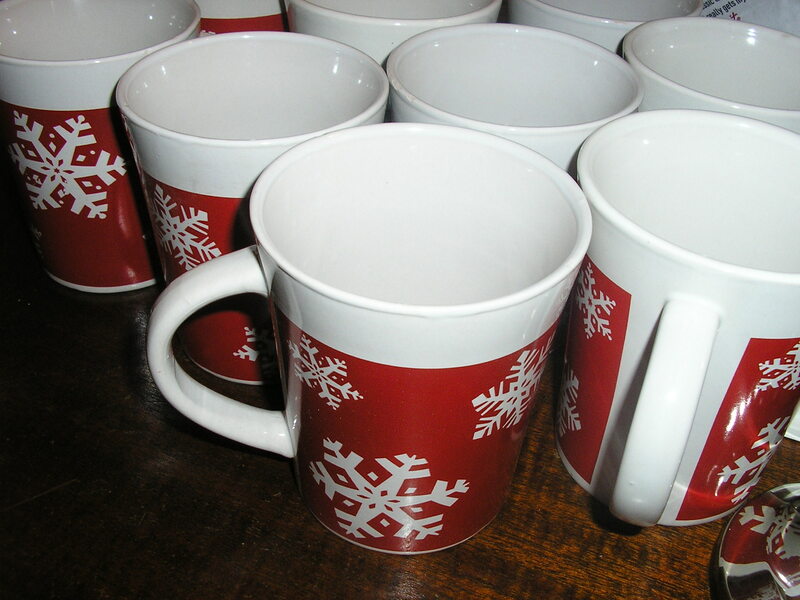 Won’t these be adorable on the table at each person’s place setting? For now I just put them in a bowl to display them. 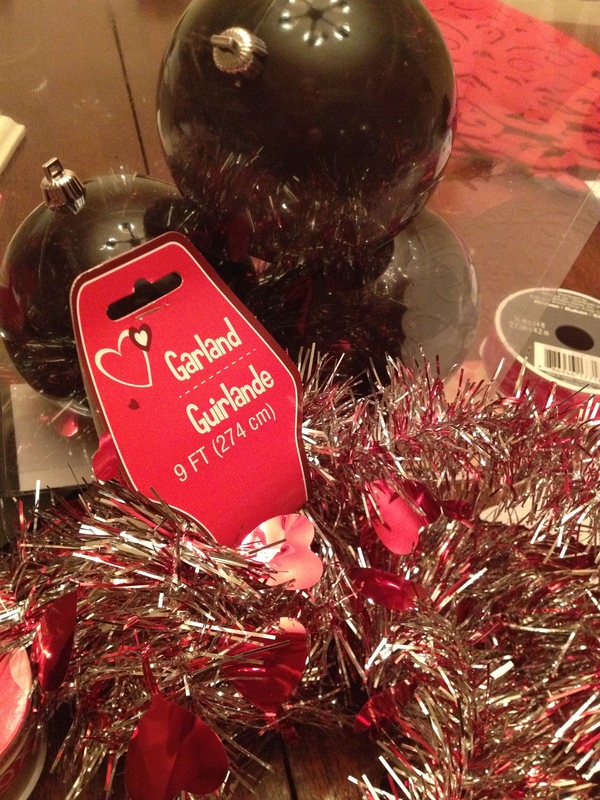 Then I found this Valentines garland at the dollar store. Perfect! All I did was cut 6″of garland, thread the garland through the ornament hanger top and then twisted the end of the garland to the “fuse” to secure it. 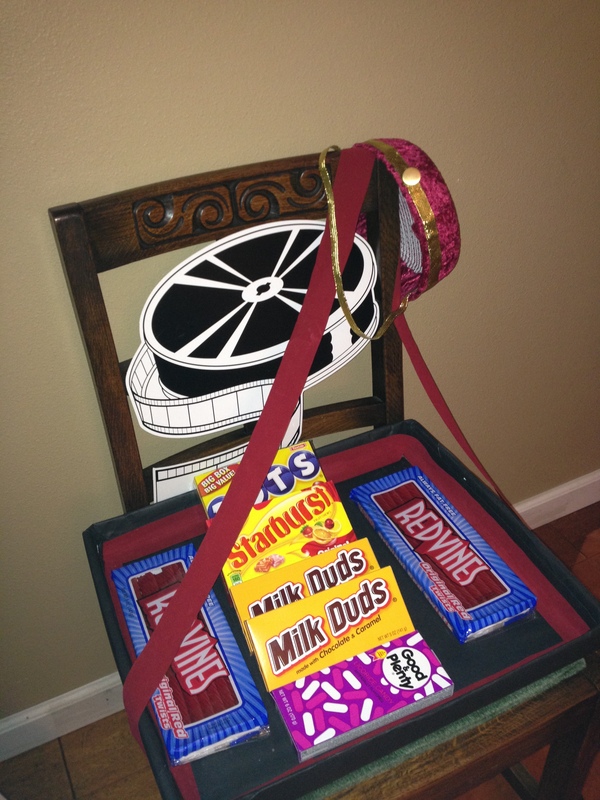 I then added a tag with a silver treat bag twisty ties I had on hand. You could fill the ornament with confetti or bath salts or homemade pixie candy made from sugar and Jello mix or Kool Aid. But I went a step further! 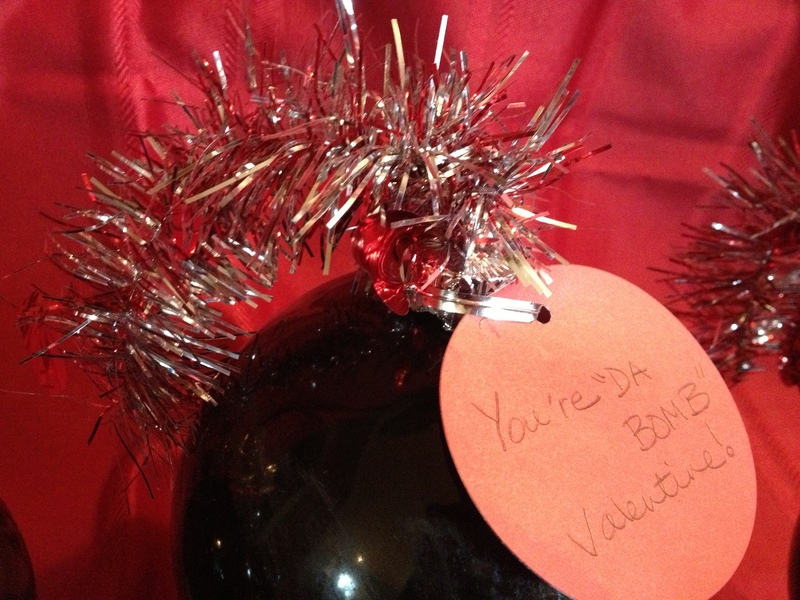 What do you do to make your Valentine’s day more “boy”ish? 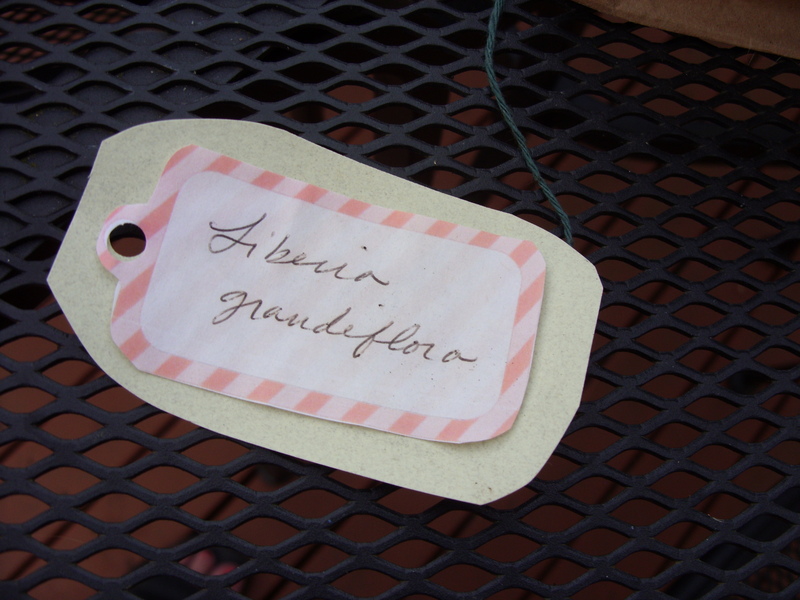 A couple of weeks ago I invited some local bloggers to come out for a sneak peek of our Gifts & Greens event and a crafty afternoon at the Arboretum. We enjoyed coffee (thanks to Zoka Coffee Roasters!) and mimosas, and played with holiday greens. I showed them several quick and simple ways to use greens in decor, on the table or on gift packages. I know that Christmas is nearly upon us, but there’s still time to do some holiday crafting with what you have handy in your yard and home! 1. 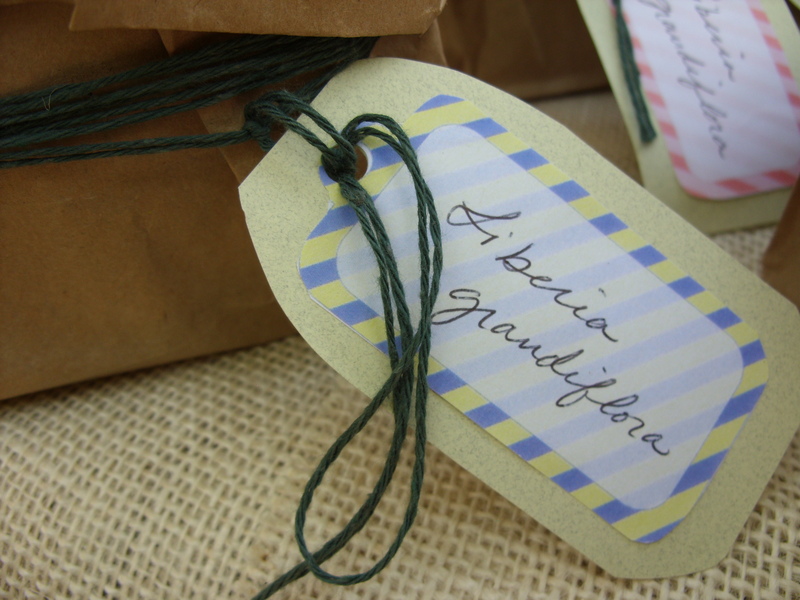 Use fresh greens and ribbons to decorate packages as I have done on these swag bags above. 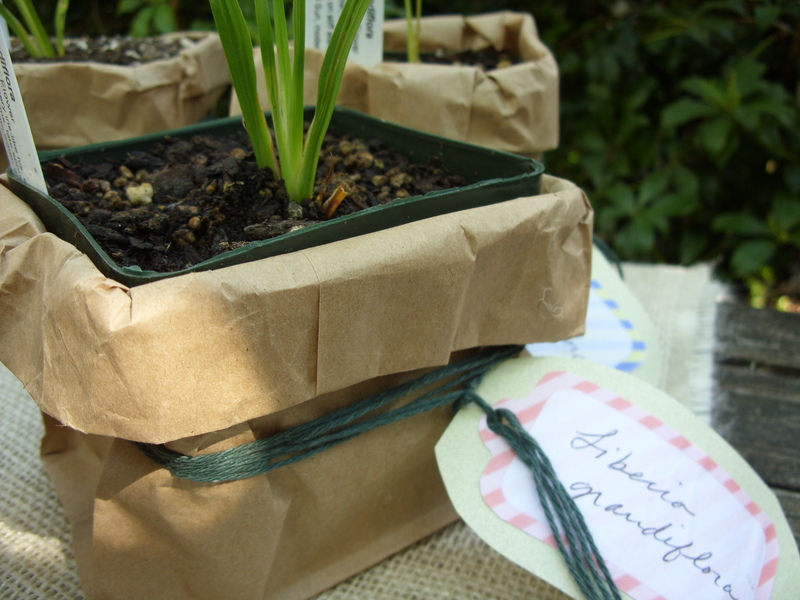 Just tie a bunch with a lovely ribbon to a bag or package. Check out Patty’s Utopia blog for more photos highlighting other packages I did. For the food lover on your list, at her Gifts & Greens Galore demo, local entertaining expert Alexandra Hedin also showed us how to make fresh mini rosemary wreaths to tie as decor onto packages -They smell so good and have a purpose in cooking after the recipient opens the gift! You can look at my tutorial from last year to learn how to make these! 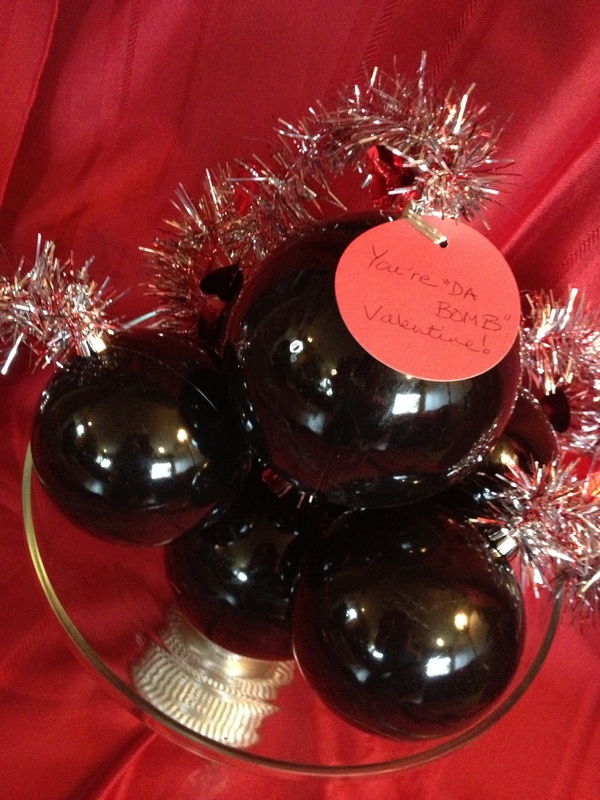 I made them for chair decorations last year and then sent them home as a little parting favor for my guests. 2. This fun floating candle in a jar is so fast to put together. Even the kids can help with this one! For a step-by-step how-to, check out Feeling Crafty’s blog post. She did a great job of showing how to put these together! 3. For a nice centerpiece, place one large Magnolia leaf (or a cutting of 3-4 leaves) in a large candle holder with a white pillar candle. Place on a tray and surround with small glasses filled with cuttings and then decorate with small ball ornaments or bells tied with string. 4. Top candlestick holders of varying sizes, heights and materials with a single pine cone and group them or line them down your table. 5. 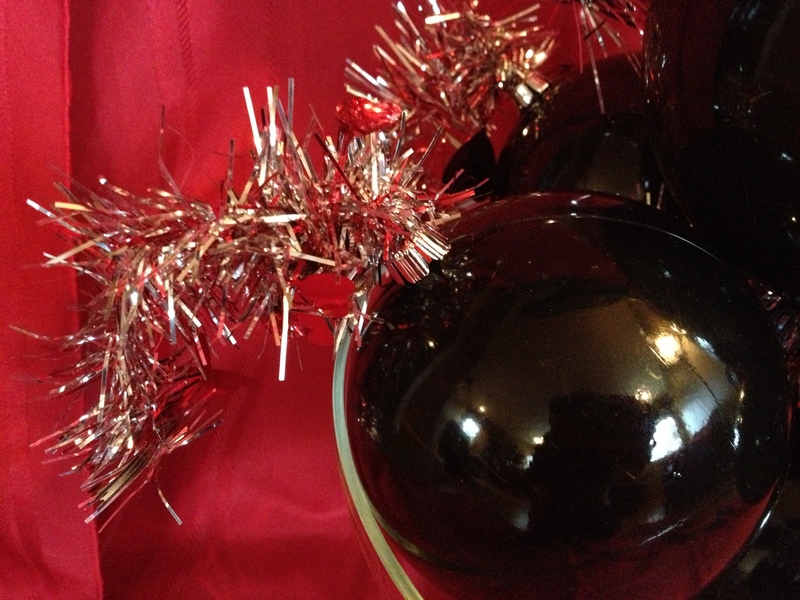 For another centerpiece idea, fill a bowl with glass Christmas balls and stuff sprigs of greenery in between the ornaments. A glass bowl works wonderfully here to show off the contrast in colors between the balls and the greens. You can also add a couple of candle stick holders flanking each side of the bowl – place one cutting and one ornament on top of each. 6. To quickly add some fresh greenery to your holiday decor, simply fill vases with several cuttings from your yard as I have done in the steel containers above. Don’t over think this – it is meant to look natural! But it’s beautiful! Right? This took no more than two minutes! 7. 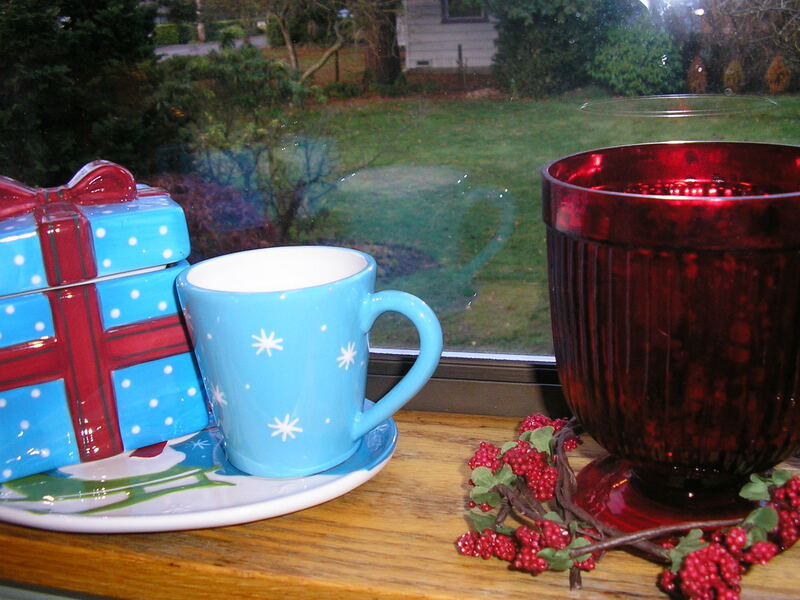 I always have tulips in a vase in my home at the Holidays – it’s very traditional in Scandinavian countries. This year I upgraded this look by adding cedar branches to the vases with white and red tulips – I just love how it turned out! 8. At each place setting use a large single leaf like a Magnolia, between a clear glass plate and charger. 9. 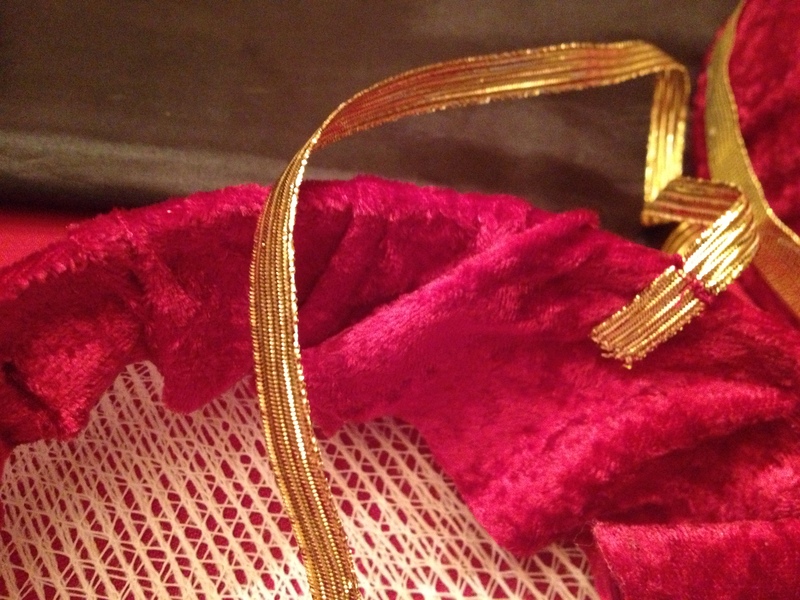 Use baker’s twine to tie a sprig of evergreen to a folded napkin and place on each plate. 10. 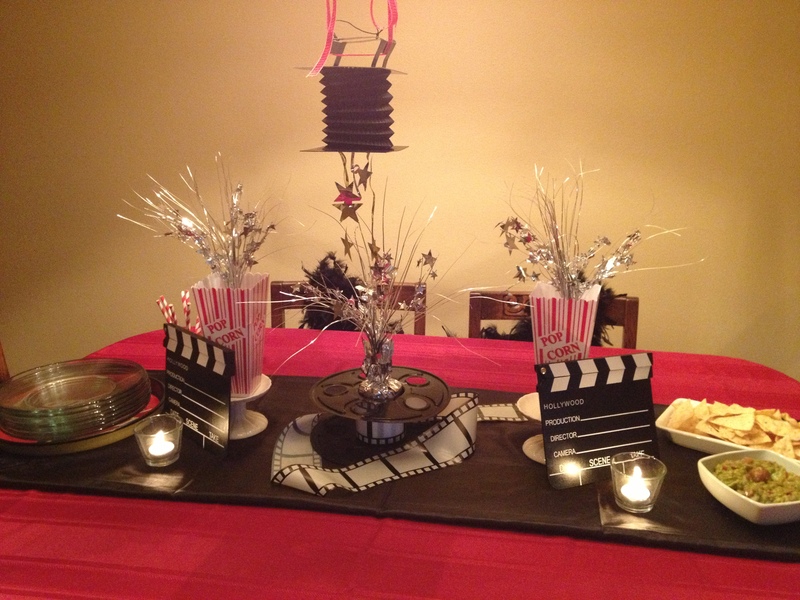 Love this star place setting! Simply form a star shape from florist wire – or any wire – and wrap with greenery. Top with a handmade name card and place at each setting. How are you using greens in your holiday decor? 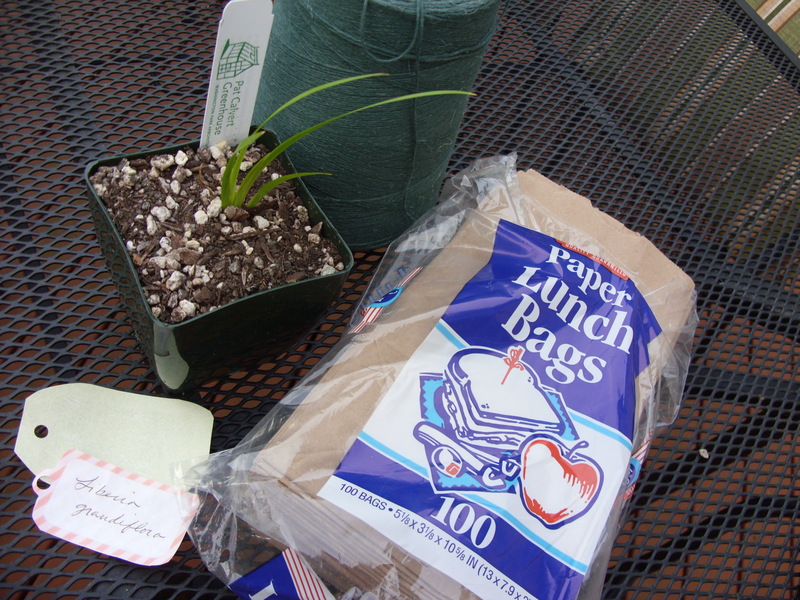 Rustic Plant Party Favors – Easy DIY! I always like to send my party guests home with a little parting gift. I try to make it something that is memorable and useful. 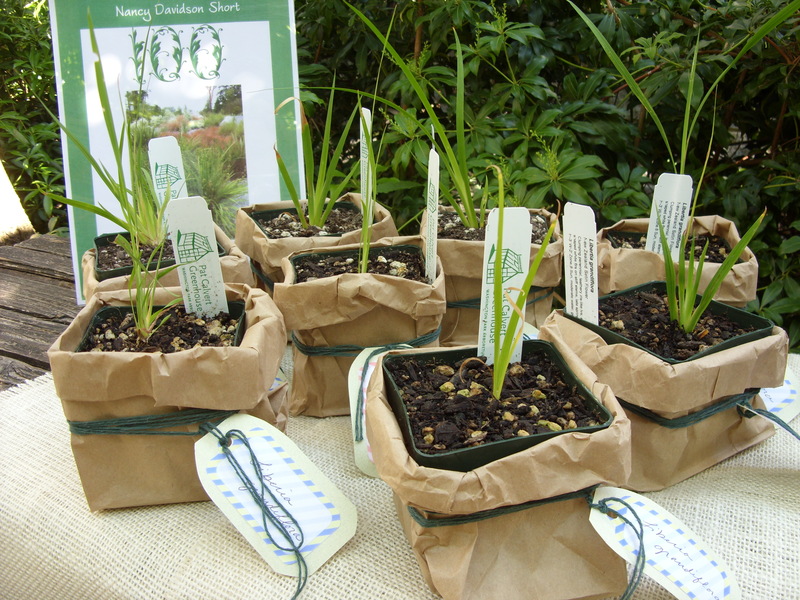 Since fall is the best time for planting, today I want to show you the perfect gift for your guests at your fall party. 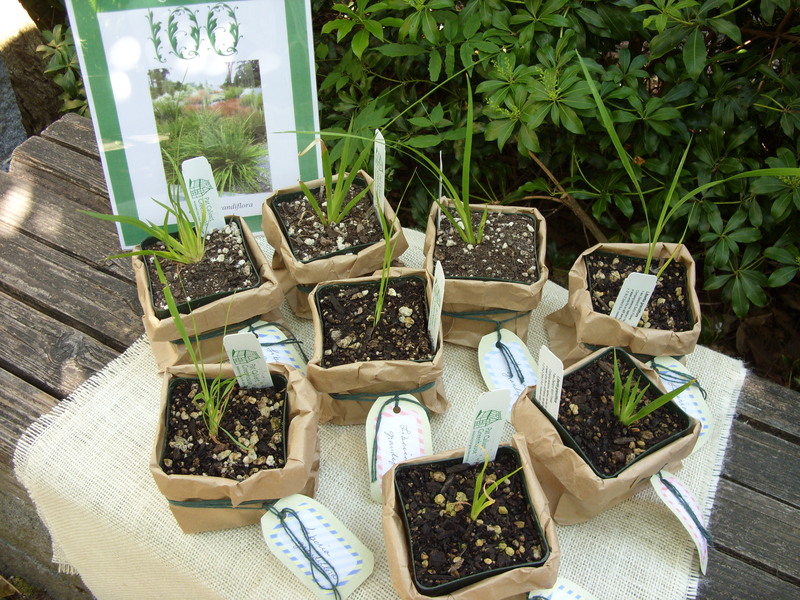 I made these plant party favors for our fabulous 100th birthday party at the Arboretum. I was originally going to use burlap to wrap them, but quickly discovered that covering 100 plants in burlap would be out of my budget. So as I stood in the fabric store contemplating what I could do, it struck me. 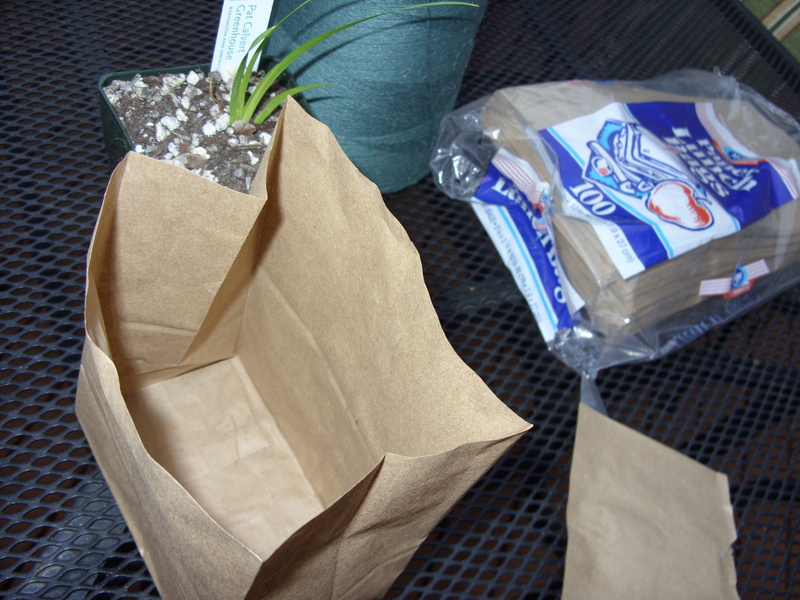 Paper lunch sacks! They are just the right size, still the rustic-earthy look I was going for, and oh, so affordable! You can make this even more cost-conscience if you dig some starts from your own yard, though many garden centers have much of their inventory on clearance at this time of year. 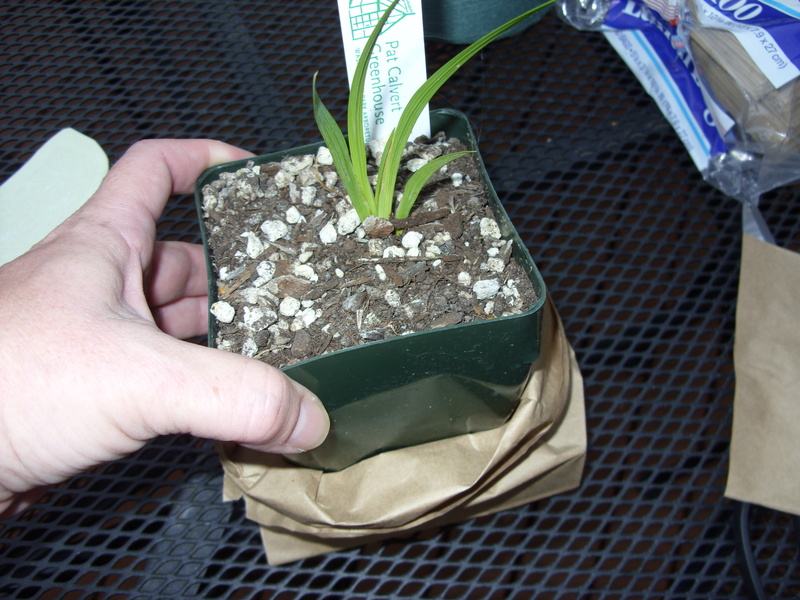 plant starts in 4 ” pots. 1. 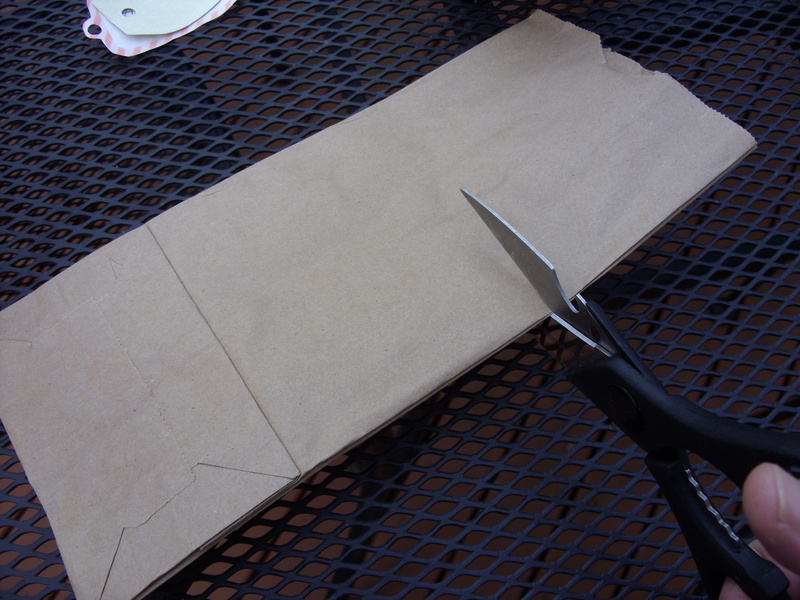 Trim the top of the bags off at 6″ from the bottom. 2. 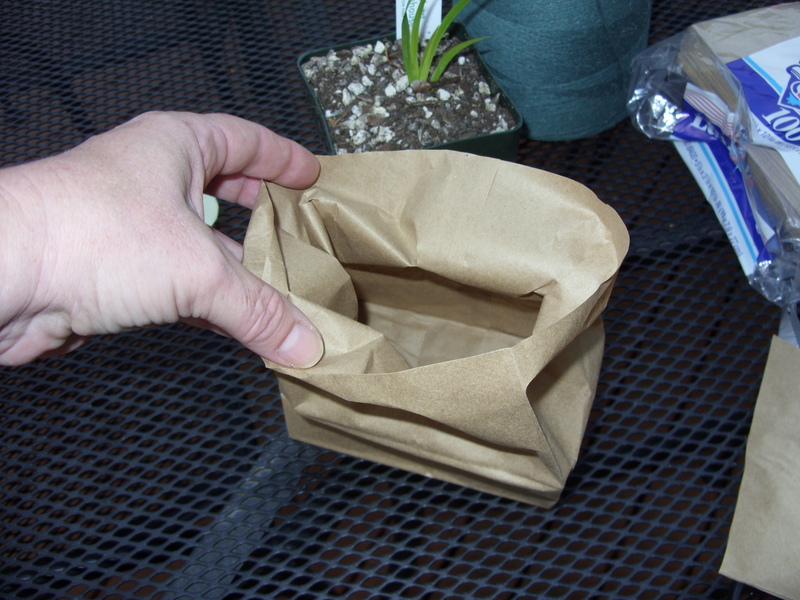 Open up the sack and then roll down the sides. It doesn’t have to be perfect – remember, these are supposed to look rustic. 3. 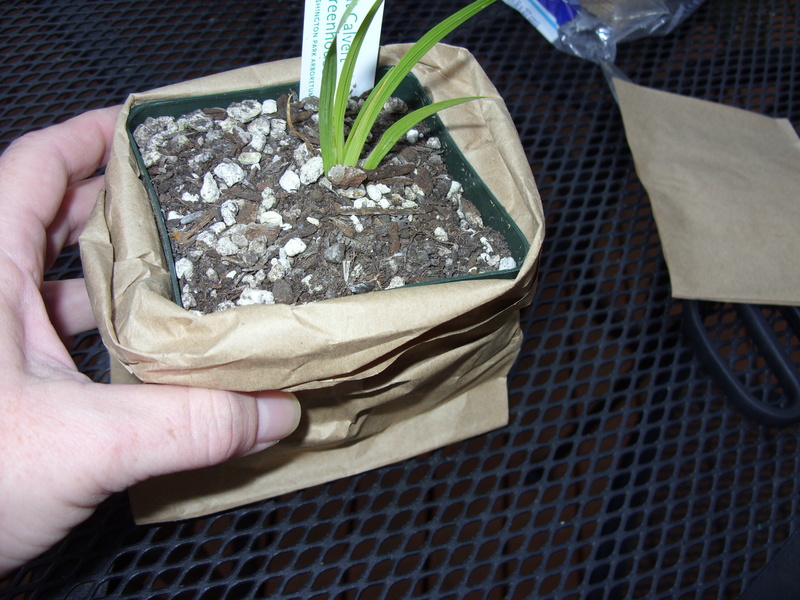 Place plant inside the bag. And roll and scrunch the bag until you have the look you want. 4. 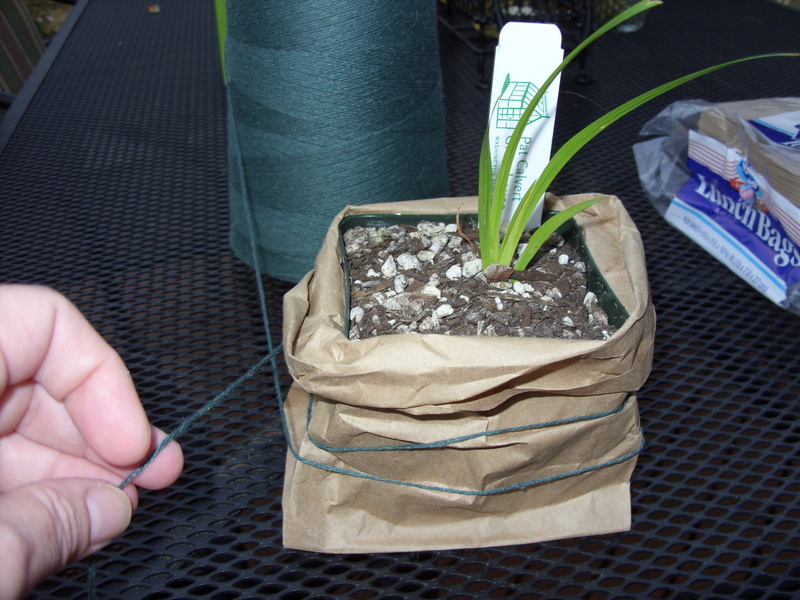 Wrap the string around the middle of the pot several times. Alternate wrapping loosely and tightly. This will give it a more natural look. 5. 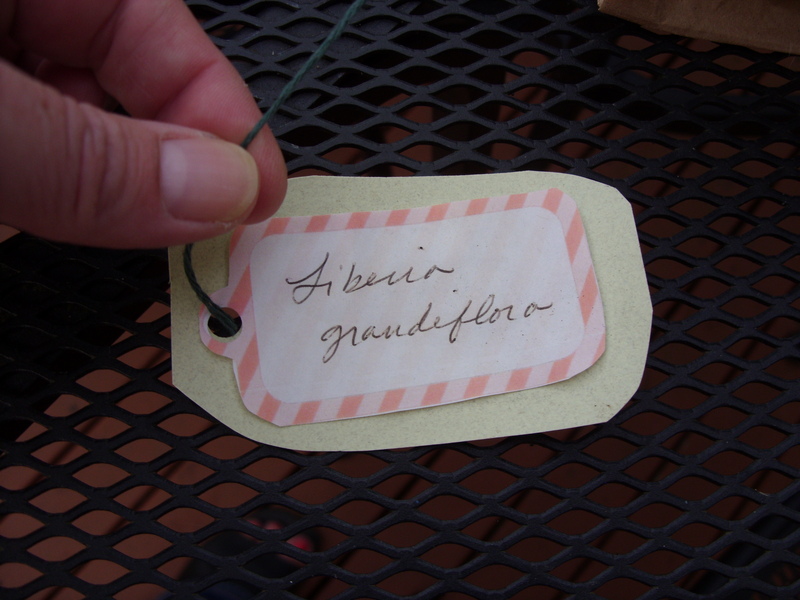 Print out tags – I used these free printables I found online and hand wrote the name of the plant on each of them. 6. I made a bigger plain tag to attach it to, just to give it a more finished look. 7. Glue the tags to each other and punch a hole. 8. Thread the two ends of the string through the tag. Then tie it off in a knot. What a nice little gift! Your guests are going to love these! They will think of you and remember your wonderful party each time they see it growing in their yard. 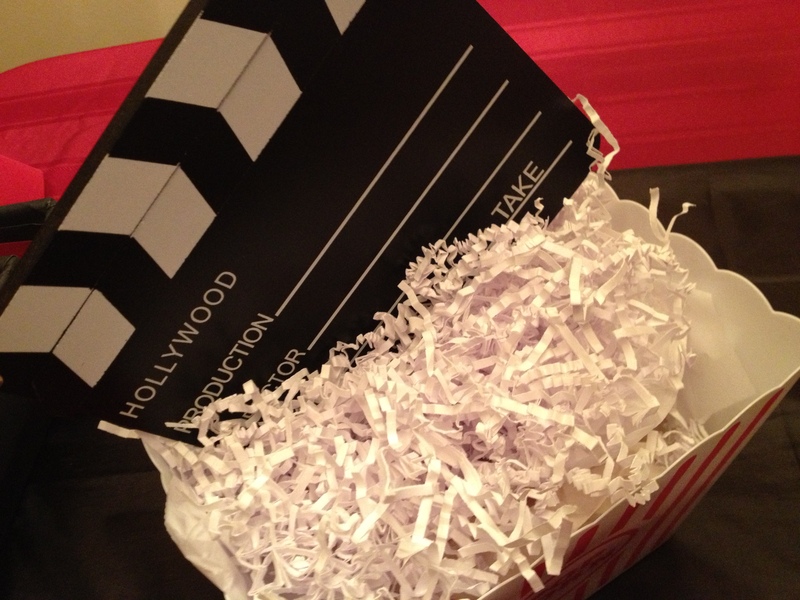 What do you like to send your guests home with? 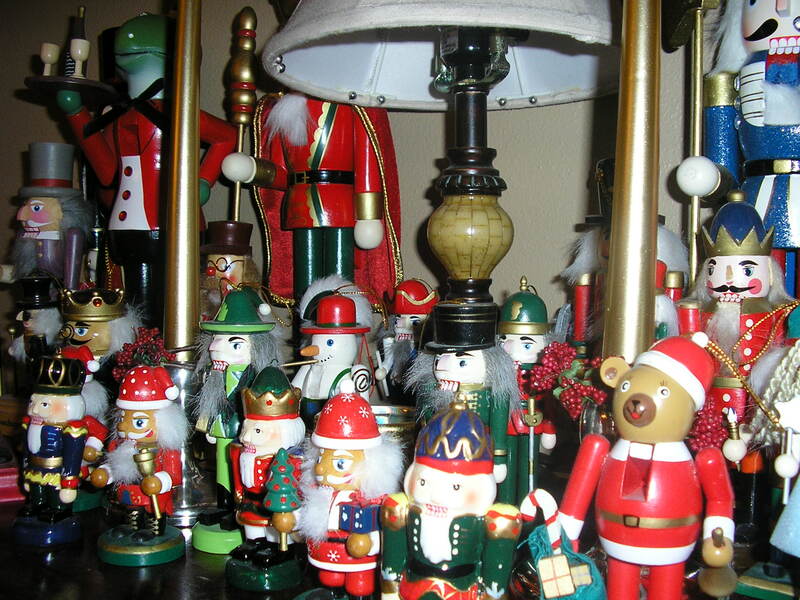 I may have mentioned already that I am feeling a bit behind this holiday season. 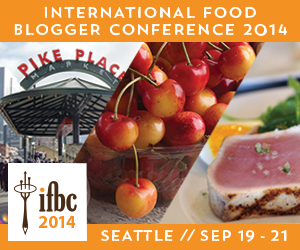 This year has been that way – life just keeps happening and, with all the changes in my life, keeping me preoccupied. The last few weeks things in particular have been a bit frenetic what with being sick, and producing my first event at my new job. and did my menu planning for next weekend – including throwing together a big pot of soup for the next couple of days worth of lunches. I have decided that Saturday’s family Open House will be a very simple buffet filled with apps and desserts, Christmas Eve will be an ode to my Norwegian heritage with my great-grandma’s meatballs and on Christmas we will pay tribute to both my husband’s and my German roots with rouladen. Sandwiched in between those meals, on Christmas morning, will be easy cinnamon rolls (so easy because I buy them from the bakery!) with some good sausage or bacon complete with mimosas and home-made hot chocolate and marshmallows (we should have plenty of these on hand at week’s end 😉 )Wait till you see! Every year I make some home-made gifts and even though I am running out of time this year I was not about to let that stop me! 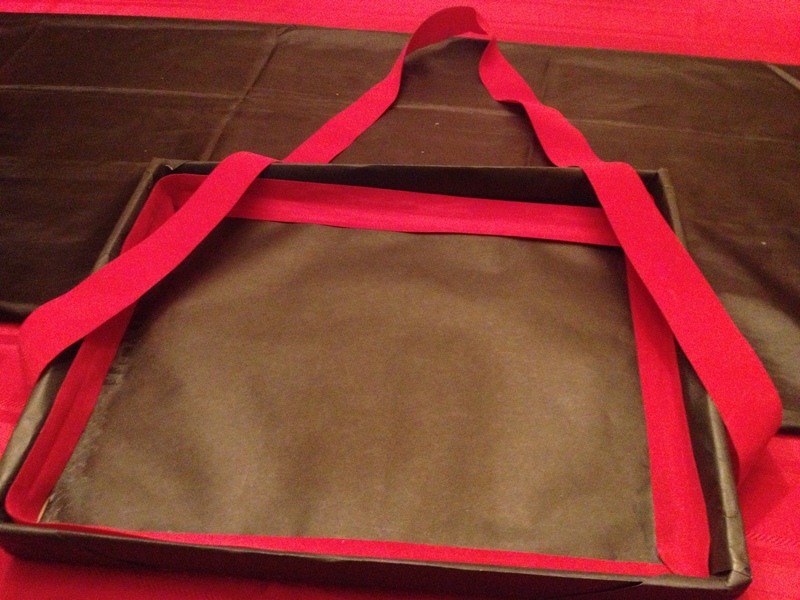 I scoured the web and found some fast, easy gifts from the kitchen to make and give. As the week goes on, I thought I would share some of these cute ideas with you so that you can journey with me as I attempt, while working full-time, to finish making these last-minute gifts. Maybe it will inspire you to put together something really simple and made from your own hands – even in the eleventh hour! The first one I made this weekend (in less than five minutes!) 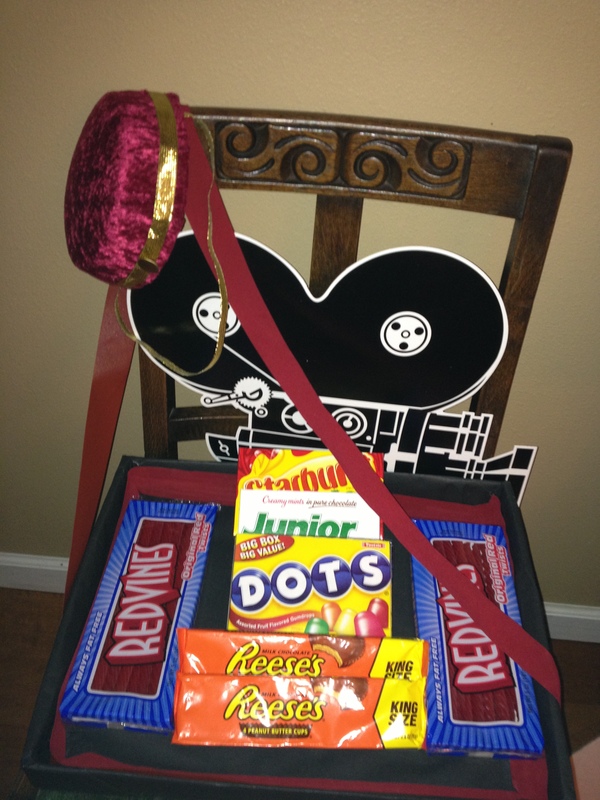 is probably the easiest gift I have ever made and only cost me around $9 apiece! Who knew that homemade vanilla extract could be so easy? 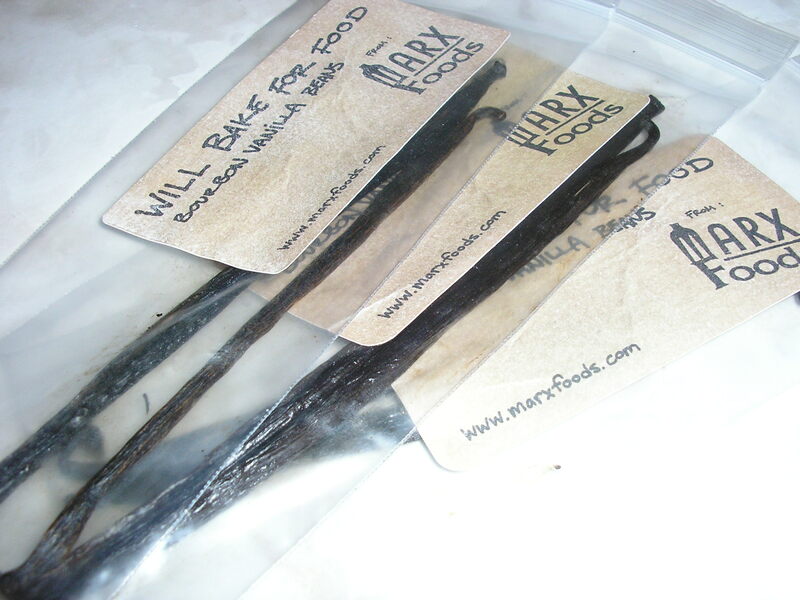 I had several of these bourbon infused vanilla beans that I scored at this year’s Will Bake For Food from Marx Foods so I decided that vanilla extract would be a great gift for the bakers in my life. 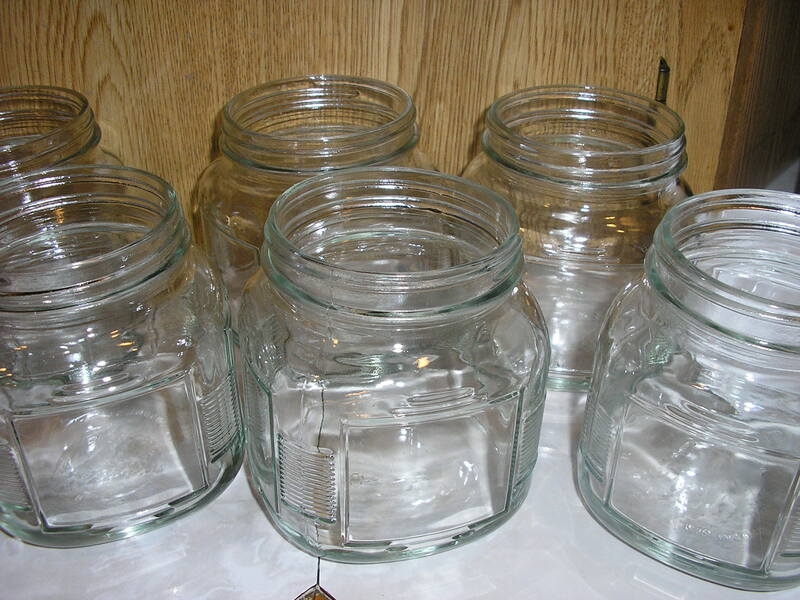 I looked up several recipes and they were all were the same – soak some vanilla beans in some vodka for a time, shaking every few days. That is, they were all the same except the timing and the ratio of vanilla beans to the vodka. But I took a stab! 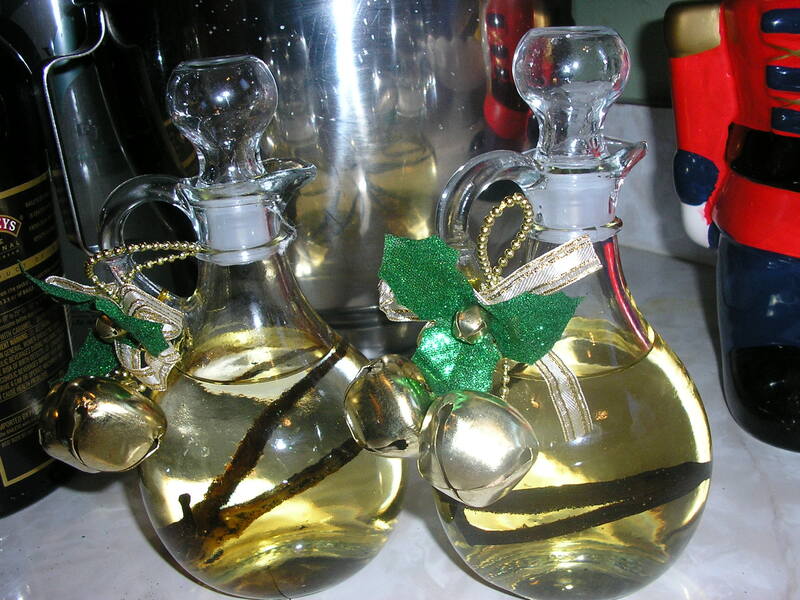 I found these cute little bottles on sale at the grocery store ($3 apiece) placed one split vanilla bean in each, then filled them with vodka (about 1-1/4 cup) – being sure to cover the bean completely. 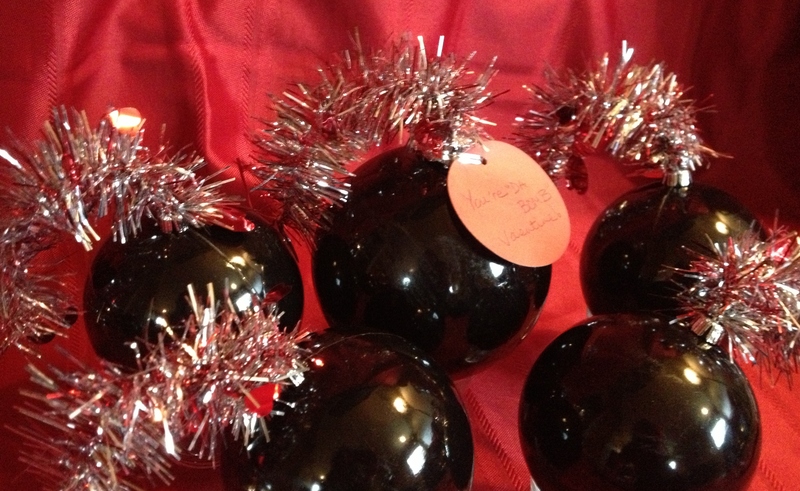 Then I just decorated the bottles and included a tag saying when it will be ready for use (3-4 weeks – though some recipes said several months!) and to shake it gently every couple of days. Turned out nicely – don’t you think? Stay tuned for more! 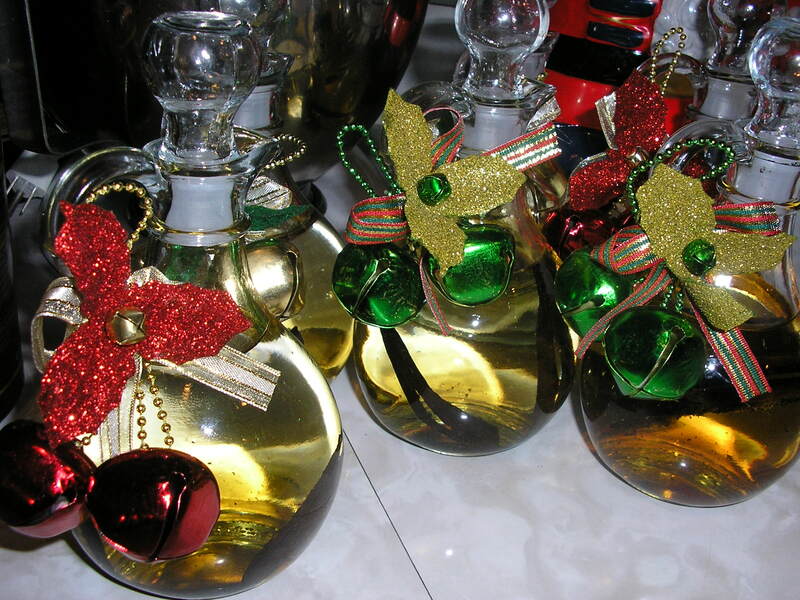 Do you have a go-to, easy-to-make gift that you like to use at times like these?